Coral reefs are classified by estimated present threat from local human activities, according to the Reefs at Risk Revisited integrated local threat index. The index combines the threat from the following activities: overfishing and destructive fishing, coastal development, watershed-based pollution, and marine-based pollution and damage. A major new survey of the world's coral reefs finds that they are in trouble. Big trouble. Overfishing and local pollution continue to grow as threats, and the reefs' long-term existence is in doubt because the world's oceans are gradually getting warmer and more acidic because of human activity. There's a lot at stake: Coral reefs are spectacular ecosystems, overflowing with diverse and colorful marine life. They're also the source of food and economic sustenance to half a billion people around the world. "Currently, we find 75 percent of the world's reefs are threatened by a combination of local and global threats," says Lauretta Burke, a senior author of the new report. "By 2030, the percentage will rise to 90 percent. By 2050, virtually all reefs will be threatened," she says. Many of the risks are familiar and long-standing. At a news conference Wednesday, Lauretta Burke, of the World Resources Institute, talked about overfishing, and runoff of sewage and sediments from the shore. "But perhaps the most shortsighted threat to reefs is the use of destructive fishing practices: the use of poisons to stun and capture fish, the use of explosives to kill fish," she says. Abundant sea life with hard and soft corals grows on a coral reef in the Indonesia-Pacific region. The report also folds in global threats. Greenhouse gases pouring into the atmosphere from our tailpipes and chimneys warm the oceans, causing heat stress to corals. Lots of that carbon dioxide also dissolves in the ocean, creating carbonic acid, which can eventually corrode coral and other shell-building animals. Add it all together, and one-third of all coral species are at risk of extinction, says Nancy Knowlton of the Smithsonian Institution's Marine Biology Research Institution. "This makes corals the most endangered animal on the planet," she says, "even more endangered than frogs, which have gotten a lot of press because of the diseases that have wiped out a lot of frog populations. And of course this is just the corals — it doesn't count all the things that depend on corals." "These are dire projections," Burke says. But it doesn't have to be that way: "These results assume no improvement in management, no reduction in local threats, and that we continue on our current trajectory of greenhouse gas emissions." And that current emissions trajectory gives us a small grace period. "The tipping point comes sometime between 2040 and 2050, which is not that far away," Knowlton says. Local threats are potentially easier to deal with, and there has been some progress in that regard. For example, President George W. Bush created vast marine protected areas in the Pacific to preserve reefs in U.S. territorial waters. "We obviously need more marine protected areas," Knowlton says. "Not just big ones like these, but small ones, local ones in the developing world, where major marine protected areas aren't financially possible, but small protected areas can do a lot of good." In releasing this report today, the World Resources Institute got help from one of the premiere marine biologists in this country — Jane Lubchenco, who now runs the U.S. National Oceanic and Atmospheric Administration. "It will take a Herculean effort to reverse the current trajectory and leave healthy ocean ecosystems to our children and our grandchildren," she said. And nobody sounded too optimistic about that task. In 1996, a loggerhead turtle called Adelita swam across 9,000 miles from Mexico to Japan, crossing the entire Pacific on her way. Wallace J. Nichols tracked this epic journey with a satellite tag. But Adelita herself had no such technology at her disposal. 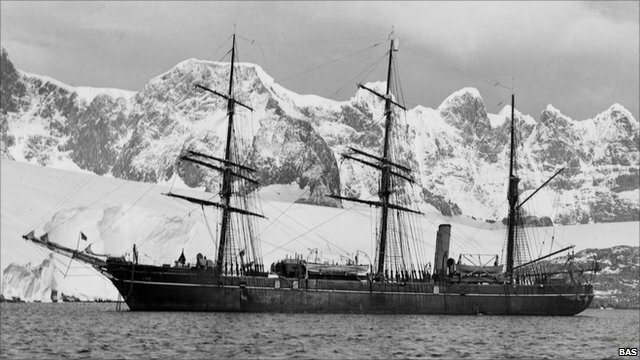 How did she steer a route across two oceans to find her destination? Nathan Putman has the answer. By testing hatchling turtles in a special tank, he has found that they can use the Earth’s magnetic field as their own Global Positioning System (GPS). By sensing the field, they can work out both their latitude and longitude and head in the right direction. Putman works in the lab of Ken Lohmann, who has been studying the magnetic abilities of loggerheads for over 20 years. In his lab at the University of North Carolina, he places hatchlings in a large water tank surrounded by a large grid of electromagnetic coils. In 1991, he found that the babies started swimming in the opposite direction if he used the coils to reverse the direction of the magnetic field around them. They could use the field as a compass to get their bearing. Later, Lohmann showed that they can also use the magnetic field to work out their position. For them, this is literally a matter of life or death. Hatchlings born off the coast of Florida spend their early lives in the North Atlantic gyre, a warm current that circles between North America and Africa. If they’re swept towards the cold waters outside the gyre, they die. Their magnetic sense keeps them safe. Using his coil-surrounded tank, Lohmann could mimic the magnetic field at different parts of the Earth’s surface. If he simulated the field at the northern edge of the gyre, the hatchlings swam southwards. If he simulated the field at the gyre’s southern edge, the turtles swam west-northwest. These experiments showed that the turtles can use their magnetic sense to work out their latitude – their position on a north-south axis. Now, Putman has shown that they can also determine their longitude – their position on an east-west axis. He tweaked his magnetic tanks to simulate the fields in two positions with the same latitude at opposite ends of the Atlantic. If the field simulated the west Atlantic near Puerto Rico, the turtles swam northeast. If the field matched that on the east Atlantic near the Cape Verde Islands, the turtles swam southwest. In the wild, both headings would keep them within the safe, warm embrace of the North Atlantic gyre. Before now, we knew that that several animal migrants, from loggerheads to reed warblers to sparrows had some way of working out longitude, but no one knew how. By keeping the turtles in the same conditions, with only the magnetic fields around them changing, Putman clearly showed that they can use these fields to find their way. In the wild, they might well also use other landmarks like the position of the sea, sun and stars. Human sailors also worked out how to measure longitude, as described in Dava Sobel’s bestselling book. They relied on an accurate clock created by the Englishman John Harrison, which allowed them to compare the time of day at a given location with that at a distant place. Every hour of difference represented fifteen degrees of longitude. But we know that turtles don’t use a similar time-based method because Putman didn’t test them under different conditions of light or dark. His hatchlings had no way of telling what time it was. Indeed, to use a time-based map in the wild, the turtles would need to have an internal clock that stayed set at Florida time for their entire 3-15 year migration. Instead, Putman thinks that the turtles work out their position using two features of the Earth’s magnetic field that change over its surface. They can sense the field’s inclination, or the angle at which it dips towards the surface. At the poles, this angle is roughly 90 degrees and at the equator, it’s roughly zero degrees. They can also sense its intensity, which is strongest near the poles and weakest near the Equator. Different parts of the world have unique combinations of these two variables. Neither corresponds directly to either latitude or longitude, but together, they provide a “magnetic signature” that tells the turtle where it is. Scientists often talk about a magnetic “map”, but the animals aren’t necessarily using any sort of mental chart. As with all research in magnetic senses, it’s very hard to work out what the animal is actually sensing or thinking. But that can be a bonus. We do, however, know that they have their super-sense from birth. Putman’s turtles had never been in the ocean before and their magnetic sense doesn’t depend on experience. Indeed, Lohmann’s previous experiments showed that even newly hatched loggerheads can react correctly to different magnetic fields. For Lohmann, these tribulations are worth it. After spending graduate school on spiny lobsters and sea slugs (two animals that also have magnetic senses), he had an opportunity to study young loggerheads. “I thought it was worth a try to see if turtles could detect magnetic fields. I figured that after the two-year project was over, I would get back to the invertebrates,” says Lohmann. Today 178 charts / 340 including sub-charts for New Zealand are displayed in the Marine GeoGarage. Google Maps puts the harbor of the northern German city of Emden inside the Netherlands. After complaints, the company is working to fix it. But where the correct border lies is actually still a matter of dispute. 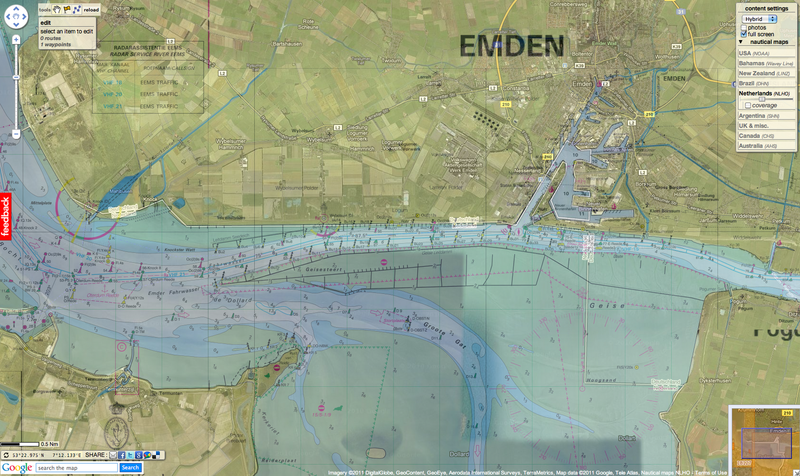 The city of Emden in northern Germany has lost its harbor - at least according to the Internet service Google Maps. 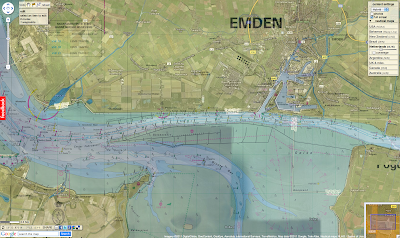 According to maps of the area provided by the European Union, the border between the Netherlands and Germany runs neatly through the middle of the Ems estuary, leaving Emden and its port entirely in Germany. But Google has the gray line demarcating the border wind deep into the inner harbor so that all an Emden resident has to do to visit the Netherlands is dip a toe in the waters off the city's piers. A couple of years ago, the city of Emden began receiving e-mails from residents upset about Google's encroaching gray line. According to city spokesman Eduard Dinkela, Emden officials then contacted Google, alerting them to the error. Despite repeated e-mails, he said, no one at Google had responded and Google Maps continues to make the harbor part of the Netherlands. "It just can't be that way," Dinkela said. "If they had used a little logic or looked at the history at all, then they would have noticed [the mistake]. But apparently no one at Google got that far or they don't do that there. In any case, they've marked it incorrectly." But it's the history that in fact makes Google's job complicated. Emden and its harbor sit on Dollart Bay, part of the Ems estuary where the Ems river meets the North Sea. On one side of the estuary is Germany and on the other side is the Netherlands. It's been an ongoing debate over the centuries and after World War II the two countries tried to come up with a formal agreement. But they couldn't, according to Dinkela. Instead, he said, "they agreed to disagree." Germany sees the border running along the Netherlands' dikes on the Dutch side of the estuary; the Netherlands puts it further out into the water. Google has admitted that there appears to be a mistake in the map of the German-Dutch border. Company spokesman Stefan Keuchel said the error may be related to the ongoing dispute. Google gets the data for its maps from a variety of sources, he said, including local providers. The goal is to have the most accurate and up-to-date information possible, and a "neutral or internationally recognized depiction of disputed areas." "It's a challenge. We really work hard and are careful to interpret the data that we receive from our providers and correct any potential bias," he said. "There seems to be a mistake and we'll work hard to correct it." Asked why Emden hasn't heard from the Internet giant, Keuchel said the appropriate department never received the e-mail. US scientists, speaking at the annual meeting of the American Association for the Advancement of Science (AAAS) in Washington Saturday, said climate change could increase exposure to water-borne diseases originating in the world’s oceans, lakes and coastal ecosystems, adding that the impact will most likely be felt within the next 30 years, and as early as the next 10 years. Numerous studies have shown that shifts from climate change make ocean and freshwater ecosystems more susceptible to toxic algae blooms and allow harmful microbes and bacteria to rapidly grow and multiply, said researchers from the National Oceanic and Atmospheric Administration (NOAA). “These studies and others like it will better equip officials with the necessary information and tools they need to prepare for and prevent risks associated with changing oceans and coasts,” said Jane Lubchenco, Ph.D., undersecretary of commerce for oceans and atmosphere and NOAA administrator. In one study, NOAA researchers modeled future ocean and weather patterns to predict the effect on blooms of Alexandrium catenella, most commonly known as toxic “red tide,” which builds up in shellfish and can be fatal to humans who eat the contaminated seafood. “Our projections indicate that by the end of the 21st century, blooms may begin up to two months earlier in the year and persist for one month later compared to the present-day time period of July to October,” Stephanie Moore, one of the scientists who worked on the study, told AFP. Prolonged harmful algal bloom seasons could mean more days the shellfish fishery is closed, threatening the vitality of the shellfish industry. “Changes in the harmful algal bloom season appear to be imminent and we expect a significant increase in Puget Sound and similar at-risk environments within 30 years, possibly by the next decade,” said Moore. Natural climate variability also plays a role in the length of the bloom season from one year to the next. Therefore, in any given year, the change in the bloom season could be more or less severe than implied by the long-term warming trend due to climate change. In another study, NOAA scientists found that desert dust that gets deposited into oceans from the atmosphere could also lead to increases of harmful bacteria in seawater and seafood. Researchers from the University of Georgia found that adding desert dust to seawater significantly stimulated the growth of Vibrios -- a group of ocean bacteria that can cause gastroenteritis and infectious diseases in humans. “It is possible this additional input of iron, along with rising sea surface temperatures, will affect these bacterial populations and may help to explain both current and future increases in human illnesses from exposure to contaminated seafood and seawater,” said the researchers. “Within 24 hours of mixing weathered desert dust from Morocco with seawater samples, we saw a huge growth in Vibrios, including one strain that could cause eye, ear and open wound infections, and another strain that could cause cholera,” Erin Lipp, who worked on the study, told the French news agency. The amount of iron-rich dust that has fallen into the sea has increased over the past 30 years and is expected to continue to rise, based on precipitation trends in western Africa which are causing desertification. Since 1996, Vibrios cases have increased 85 percent in the United States based on reports that primarily track seafood-illnesses. It is possible this additional input of iron, along with rising sea surface temperatures, will affect these bacterial populations and may help to explain both current and future increases in human illnesses from exposure to contaminated seafood and seawater. And researchers at the University of Wisconsin-Milwaukee warned that an increase in rainfall could also cause more sewage overflows, which would release disease-causing bacteria, viruses and protozoa into drinking water and onto beaches. Spring rains are expected to increase over the next 50 years, and with that increase, aging sewer systems are more likely to overflow because the ground is frozen and rainwater cannot be absorbed, said Sandra McLellan, Ph.D., at the University of Wisconsin-Milwaukee School of Freshwater Sciences. As little as 1.7 inches of rain in a 24-hour period can cause an overflow in spring, and the combination of increased temperatures with increased rainfall can magnify the impact. McLellan and colleagues showed that under worst case scenarios there could be an average 20 percent increase in volume of overflows, and the overflows could last longer. In Milwaukee, infrastructure investments have reduced sewage overflows to an average of three times per year, but other cities around the Great Lakes still experience overflows up to 40 times per year. “Hundreds of millions of dollars are spent on urban infrastructure, and these investments need to be directed to problems that have the largest impact on our water quality,” said McLellan. In the past 10 years there have been more severe storms that trigger sewage overflows. While there is some question whether this is due to natural variability or to climate change, these events provide another example as to how vulnerable urban areas are to climate. “Understanding climate change on a local level and what it means to county beach managers or water quality safety officers has been a struggle,” said Juli Trtanj, director of NOAA's Oceans and Human Health Initiative and co-author of the interagency report A Human Health Perspective on Climate Change. “These new studies and models enable managers to better cope and prepare for real and anticipated changes in their cities, and keep their citizens, seafood and economy safe. Hop into this Ego Compact Semi Submarine, and without any extensive training you can be on your way to exploring the deep blue sea in no time. Why is this called a semi-submarine? The entire boat is not submerged, but it’s more like a pontoon boat with a transparent waterproof compartment hanging from its middle. That means James Cameron is not going to be using one of these subs for that deep-water shoot for his Avatar sequel, but it’s still suitable for giving you an eye-popping view of the undersea world. Think of it as more akin to snorkeling than scuba diving. The little boat cruises along at a leisurely sightseeing pace that’s unspecified by its maker, which will only say that its batteries will last eight hours at cruising speed or four hours at top speed. It’s built by South Korean company Raonhaje, which plans to sell fleets of these Ego Semi-Submarines to resorts, and single units to individuals and yacht owners. The company offers to build custom moorings for the craft, as well as hoists for yachts. We’re thinking super-safe leisure subs like these would be a huge hit at a resort, especially seaside marinas near coral reefs, with their colorful and bustling underwater wildlife. Just think, even people who can’t swim can enjoy the spectacular view. For 30 years, two General Electric facilities released about 1.3 million pounds of polychlorinated biphenyls (PCBs) into New York’s Hudson River, devastating and contaminating fish populations (see EPA). Some 50 years later, one type of fish—the Atlantic tomcod—has not only survived but appears to be thriving in the hostile Hudson environment. Researchers from Woods Hole Oceanographic Institution (WHOI) have joined colleagues from New York University (NYU) and NOAA to investigate this phenomenon and report that the tomcod living in the Hudson River have undergone a rapid evolutionary change in developing a genetic resistance to PCBs. The findings, reported online in the Feb. 17 issue of Science, provide a first look at “natural selection going on over a relatively short time, changing the characteristics of a population,” said WHOI Senior Scientist Mark E. Hahn, who, together with WHOI biologist Diana Franks, collaborated with Wirgin on the study. Looking at the ability of the fish to respond to the contaminants, the researchers found the primary changes occurred in a receptor gene called AHR2, which is important in mediating toxicity in early life stages and can control sensitivity to PCBs. In his work over the last 16 years in the Acushnet River Estuary near New Bedford, Mass., biologist Hahn has found the same gene involved in controlling other fishes’ responses to PCBs. The AHR2 proteins in the Hudson Rover tomcod, he said, appear to be missing two of the 1,104 amino acids normally found in this protein. While this may be good news for the tomcod, it may bode not so well for their predators, and even humans. 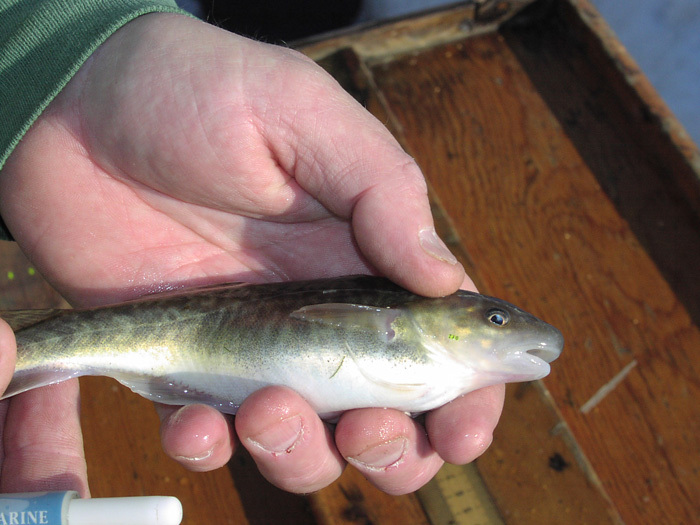 “The tomcod survive but they still accumulate PCBs in their bodies and pass it on to whatever eats them,” Hahn said. This can lead to “an abnormal transfer of contaminants up the food chain,” perhaps all the way to humans who may consume them. In addition, the tomcod’s genetic changes “could make them more sensitive to other things,” and affect their ability to break down certain other harmful chemicals, such as PAHs (polycyclic aromatic hydrocarbons), Hahn said. “So it’s conceivable that the Hudson River tomcod could be more susceptible to PAHs because it cannot degrade them properly,” he said. Also, he added, these receptors are involved in normal development, and a genetic change could lead to a change in a fish’s health. “There could be evolutionary costs,” Hahn said. “Hudson River tomcod have experienced rapid evolutionary change in the 50 to 100 years since release of these contaminants,” the researchers say in their paper. Ironically the recently begun EPA-mandated cleanup of Hudson River PCBs could be trouble for the tomcod. If there are evolutionary costs to having the variant AHR2 gene, the absence of the toxic substance that triggered its adaptation might leave it at a disadvantage. The WHOI portion of the study was funded by an NIH Superfund Research Program Center grant through the Superfund Research Center at Boston University. The NYU work was funded by an NIH Superfund Research Program individual grant and an NIH Environmental Health Sciences Center grant. "This research could not have been attempted without the unique multidisciplinary focus of our funding vehicle, Superfund Basic Research," Wirgin said. On November 26, 2010, Pakistani fishermen returned from a day at sea to report that a new island had emerged. The tiny dot of land was a mud volcano, and it was still visible on January 11, 2011, when the Advanced Land Imager (ALI) on NASA’s Earth Observing-1 (EO-1) satellite acquired the top image. The mud volcano was absent in a previous overpass on February 11, 2010, shown in the lower image. There’s no need to change any maps, however; mud volcanoes have risen off the coast of Pakistan in the past and disappeared again within a few months, washed away by the waves and currents in the Arabian Sea. It is quite likely that this new volcano will meet the same fate. Indeed, a stream of pale brown sediment was snaking away from the volcano to the west on January 11, suggesting that erosion was already underway. Pakistan’s mud volcanoes form as a result of plate tectonic activity. The Arabian plate—the section of Earth’s crust that carries the Arabian Sea—is sinking beneath the Eurasian land mass at about four centimeters per year. Some of the thick sediment and rock on top of the Arabian plate has sloughed onto the edge of the Eurasian plate, forming Pakistan’s coastal plain, the Makran Desert, and the underwater slope leading away from the shore. It is from this sloughed-off land that the mud volcanoes form. Beneath the sediment, along the accretionary front, the sinking Arabian plate heats up under extreme pressure and rock melts into magma. Volcanic gases and magma heat the groundwater, turning it in a hot acid that dissolves rock into a slurry of mud and clay. The mud and gas seep through faults, eventually erupting at the surface as a mud volcano. Pakistan has a number of mud volcanoes in the Makran Desert and offshore. According to the U.S. Geological Survey, mud volcanoes are usually less than 1-2 meters (3-7 feet) tall. But Pakistan’s Chandragup Complex includes a mud volcano that is 100 meters (330 feet) high. The same tectonic activity and fault systems that produce these volcanoes occasionally produce large earthquakes, such as the magnitude 7.2 quake that shook southwest Pakistan on January 18, 2011.